Blade length : 69.7cm or 27.44 inches. Width at the hamachi : 2.9cm or 1.14inches. Width at the Kissaki : 1.96cm or 0.77inches. Kasane : 0.64cm or 0.25inches. Shape : It is regular width and thickness. There is ample sori. It is nice shape katana. There are O-hada seen at some parts. becomes gunome midare with edgy ha mixed. Nioi is deep and smoky. There are sunagashi and faint kinsuji streaks if looked closely. 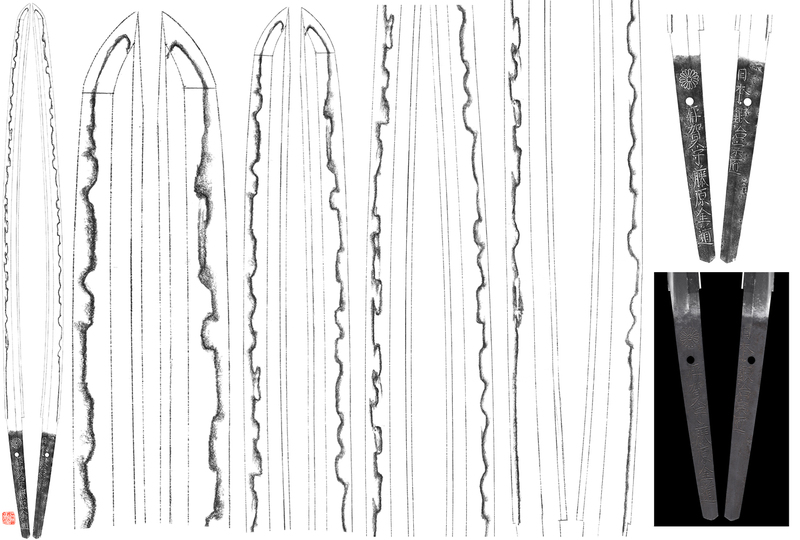 There is oshigata (print of hamon) of both side of the blade. The oshigata will be sent with the sword if purchased. Special feature : Third generation Igano kami Fujiwaka Kinmichi was called MIshina Kanbe. 4th generation Kinmichi and 3rd generation HIsamichi has been brought to Shoguntate. This piece is third generation Iga no kami Kinmichi and at the top of the signature there is Kiku-mon (chrysanthemum crest) engraved. At the back it is engraved "Nippon kaji Sosho". There are some kizu at some parts but it is no problem for display. 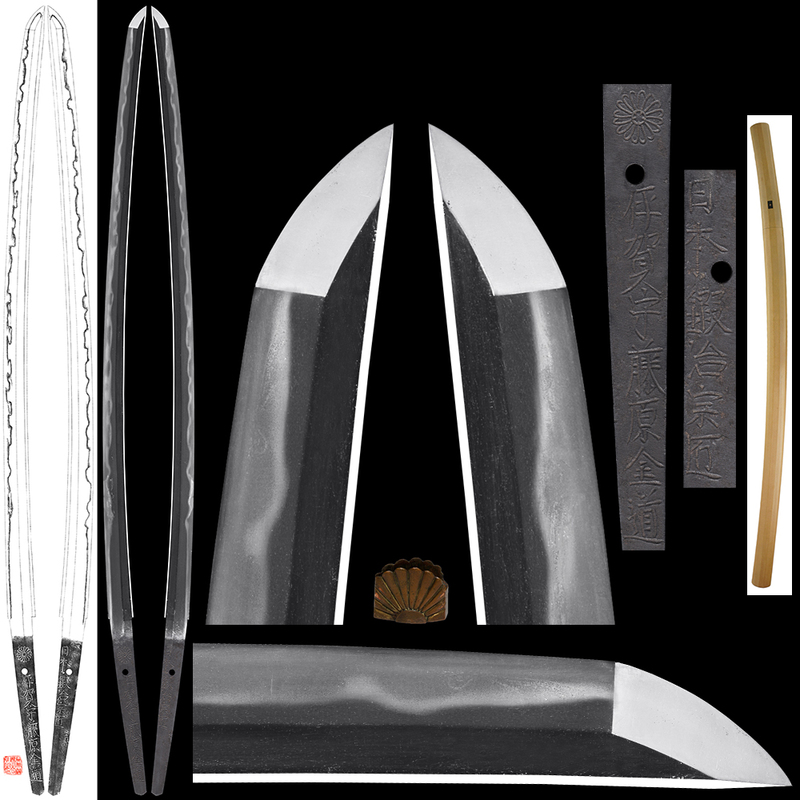 Compared to other 3rd generation Kinmichi swords, this katana is well made. There is no NBTHK certificate for this sword but this sword is genuine 3rd generation sword. Worst case, we would buy back this sword by our selling price so please do not worry. If is nice condition sword that is also ranked in wazamono piece.It is shape and nice katana. Historical Background: It is when there was a severe earthquake that is called "Hoei no O-JIshin"
or the Major Earthquake in Hoei Period. The Fuji mountain and Asamayama eruption has bought a catastrophe to the area. We guarantee NBTHK Hozon Paper (The paper is NOT issued yet).